- Check carefully your details in the approval letter to see if any incorrectly. Print out the approval letter for boarding and show to get Vietnam visa stamped on your passport at Vietnam Airports or Vietnam embassy. Please email to info@VietnamVisaForm.com to ask for correct if any. - Cash in USD, Euro or any strong currency equal to 45 USD for stamp fee of single entry visa or 65 USD for less than 1 month multiple visa, 95 USD for less than 6 month multiple visa or 5 USD for transit visa. Please note that embassy fee visa is vary from embassy to embassy, please contact them to know exactly. 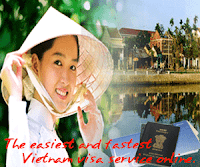 Great source of information about getting Vietnam Visa. It will make other easily understandable that how to apply for online Vietnam visa and get it approve as soon as possible. Thanks for sharing this awesome post.